Dr. Dre took to the stage at Brixton's O2 Academy during the concert to "present and represent" Anderson .Paak, BBC News reports. Of .Paak, currently featured in Apple's HomePod marketing, Dre told the crowd "This man right here is destined to be a star. Trust me." In his first on-stage performance in the UK since 2014, Dr. Dre played two of his best-known kits, "Still D.R.E" and "The Next Episode." 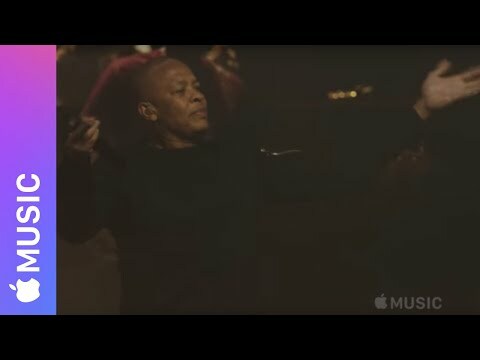 The Beats 1 Radio YouTube channel has published a brief clip of Dr. Dre's performance, and advises more clips from the concert will be published soon. The hour-long 14-song set was filmed by Apple Music, and will probably be made available to view by the streaming music service's subscribers in the near future. The Apple Music-sponsored Anderson .Paak concert was free to attend, and is the first of its kind since Apple discontinued its annual UK music festival, most recently known as the Apple Music Festival. At the time it was confirmed the festival series was ending, it was speculated Apple would instead focus on tour sponsorships, one-off shows, and smaller gigs featuring upcoming artists.